It is the beauty of Hindu Astrology which with its super scientific principles can help in predicting even years ago about the fate of a person. I know this woman for more than twelve years. She is a famous gynecologist working in Delhi for more than two decades. Her husband (not doctor) is in Govt. Job. When I first met her 12 years ago, she was blessed with a son. Seeing her horoscope, her Sun mahadasha was about to complete and next ten years of Moon�s dasha was about to begin. She took predictions from me as a normal curious woman about her family, her son�s education, her own career, etc. Seeing her natal Moon�s placement in 8th house aspected by 8th lord, I was not happy to predict much for next ten years dasha results as if some intuition was fore warning me for the negative hidden in that horoscope. Her son�s horoscope also showed an accident for which he was fore-warned to drive carefully. As she was a doctor and was not believing much in doing any remedies, she was confident to make life better with her efforts only. I had predicted that Mars Mahadasha will give her a completely changed and new life. I received many feedbacks in the Moon�s Dasha from her, about her flourishing medical practice, her husbands career ups and downs, her multi-talented son getting admission in Engineering college of south, his achievements, and her immense love for her son. One day finally in that 8th house Moon�s dasha, that hidden fear of mine about her life came out with the sudden and accidental death of her only son in a road accident by Car. Her life became a painful story of her tears for her only son. She left her medical practice and started having many health problems due to no interest in life. She many times thought to do suicide as she left faith in GOD and life. Slowly, by guiding her to chant �Narayan Kawach� daily to get peace for herself and her dead son�s soul, she started feeling positive. Finally, she decided to have her second child with the help of medical science IVF. She failed first time as her age was a major bottleneck in conception. But with the grace of GOD and her constant chanting of �Santan Gopal Mantra� for more than one year, she got blessed with the birth of a baby girl at the age of 51 years by caesarian operation in Delhi�s Gangaram Hospital on 5.12.2013 at 8:46 am. I am happy to share this real case study with all Astrology lovers which again proved the utility of this science in predicting and counseling mankind about the uncertain future with the help of �Parashary and Jamini� Principles of Hindu Astrology. NOTE---The son had died in road accident in Bangalore on 29.3.2012 night. Let�s see what the situation was and how planets indicated the delivery of the daughter after 28 years gap. The gender of the child depends on the influence of benefic planets as well as male planets and signs in respect to the above five points. MOTHER�S HOROSCOPE BIRTH DETAILS 15.7.1962,�� 00:30, PATNA, LAGNA ARIES 19 DEGREE 3MIN AND Moon in Scorpio with 24 degrees 2 minutes. Lagna is Aries with 19 degrees 3 minutes, Navansha Lagna is Cancer & Saptansha Lagna is Gemini.Moon is in 8th house in watery sign as debilitated. Only mars is aspecting it as Lagna lord. The 5th house and 5th lord Sun both are aspected by retrograde Jupiter.9th / 12th lord from 11th house. Hence promise of Lagna chart/ D1 shows positive factors for getting the native blessed with children. Venus as 2th/ 7th �lord (Marakesh) aspected by Mars as 8th lord is indicating troubles to native in relation to progeny and child Birth during delivery in Moon�s dasha. Fifth House from Moon is not having any planet but Pisces sign whose lord is in 4th house from Moon in GajKesari Yog indicating chances of the child birth. Also, Mars is aspecting its own house / 8th house with strong Saturn, Hence Longevity of woman is good. Mars is also at degree conjunction with Lagna. Fifth House from Sun is having no planet and its lord has gone to 11th from itself. Good for gains. Fifth House from Jupiter is having mercury and sun in Gemini making a good Aditya budh yog. In Navansha Chart(D9): See the 5th lord of D1 as well as D9, Sun is Vargottam in and in 12th house in Gemini with Venus. Jupiter is in 9th house in Pisces aspecting 5th house. The 5th lord Mars is Digbali in own sign and aspecting 5th house. Child birth can be there if opted. Saturn�s aspect on 5th house and lagna as 8th lord �& Rahu/ ketu aspect on 5/11 axis is indicating the unhappy event related to children in later part of life. In Saptansha Chart (D7): Lagna has Jupiter placed there with four planets in Libra in fifth house, namely 5th lord venus, 2nd lord Moon, 8/9th lord Saturn and ketu. Mars is exalted in 8th house aspecting LL Mercury. The 8th lord saturn�s placement with 5th lord in 5th is indicating promise of children but some troubles and problems to them and so to the native too. Vimshottari dasha at the time of death of Son on 29.3.2012 : Moon /Venus / Mer from 26.3.2012 to 20.6.2012. In d1, Moon and Venus both are afflicted by 8th Lord Mars. Mercury is� papkartari.4th Lord Moon is very much afflicted and ill-placed along with afflicted 4th house. Dasha clearly indicated the sad event attached with progeny.Char DASHA: Cap/ Gemini / Virgo from 14.3.12 to 13.4.12. GK Mars and DK venus is aspecting Capricorn. 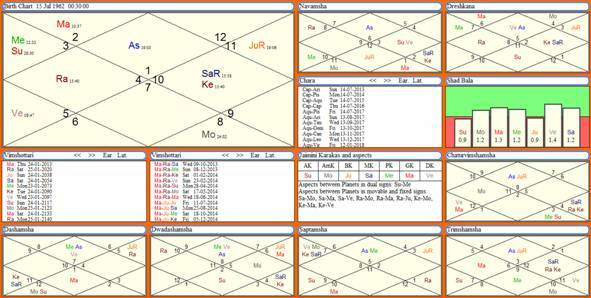 Capricorn rashi is afflicted by Sat and Ketu and are in 8th house from gemini. Ak sun and PK Mer and KL are in Gemini aspecting Virgo. The sad event about son�s death was indicated. TRANSIT on son�s death by accident: Saturn was retrograde in Libra and aspecting 5th lord Sun and PD Lord mercury in mother�s horoscope. Jupiter was transiting in Lagna and aspecting 5th house. Transiting Mars was on natal venus AD Lord in 5th house. Transiting Rahu was in 8th house on natal 4th Lord Moon, showing mental trauma and unhappiness to mother due to son�s death. Vimshottari dasha at the time of BIRTH of daughter on 5.12.2013 : Mars /Rahu/ sat from 9.10.2013 to 8.12.2013. In d1, Mars is well placed in D1 and D7. In D9 also, it is in own sign.rahu is in 4th in d1,in d9 aspected by 5th lord sat from 9th house. In D7, it is in 9th house, though aspected by exalted mars from 6th house, indicating surgery in rahu pratyanter. Dasha clearly indicated the happy event attached with progeny. Char DASHA: Capricorn/ Aries / Virgo from 13.11.13 to 13.12.13. Aries sign is in lagna and is aspected by DK Venus from 5th house and AMK Moon from 8th. Hence, event about daughter�s birth through some unhappy medical treatment was indicated. Mother was hospitalized since 22.11.2013 for delivery. TRANSIT on Daughter�s Birth by opertion: Saturn in Libra aspecting 9th house --- second child birth. Jupiter also from Gemini aspecting 9th house of mother�s horoscope, indicating second child birth. Transiting Ketu in Lagna and Rahu in 7th house afflicting 1/7 axis so mother�s body being under surgery for delivery of child at 51 years age.